Size: 5.3" x 2.7" x 0.35"
This calculator seems to be identical to the TI-1790 introduced by Texas Instruments in 1978, too. Main differences are the design and arrangement of the keys. It combines a basic calculator, a clock, alarm-time and stopwatch function in a compact housing. Don't miss the original LC-831W using two discrete displays for the calculator and clock functions. A perfect copy of this calculator was sold in the former GDR (German Democratic Republic - Eastern part of Germany) as MR411 and later MR413. Canon of Japan used similar hardware in the LC Quartz. Dismantling the LC-833WA reveals a clean layout centered around the Toshiba T3566 single-chip calculator circuit, a tiny crystal for the timekeeper and a small buzzer. Please notice that the shape of the printed circuit board (PCB) is identical with the TI-1790 and even the layout has only slight differences. 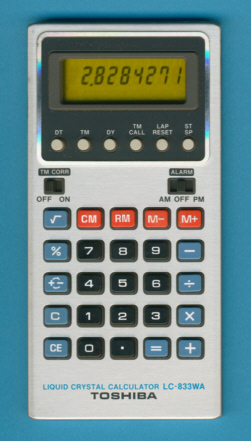 Compare this calculator with the TI-1790. The keyboard layout was later changed, notice the combined RM/CM key on the LC-834WA.